Eucerin comes in a pump and will gently pump out lotion to you at a single push. It also has a pretty large quantity for a lower price. When I ordered it I thought that it would be way too much, but I ended up using all of it. I thought it was fine as a moisturizer, but I did have a few complaints regarding its ability to help rashes and sore spots that are related to eczema and other dermatological diseases. Non-greasy, is absorbed fast by your skin, non-irritating, fragrance free, clinically proven to help flaky and dry skin feel more moisturized. I got the impression from this product that it was meant mainly for people that got a rash every now and then and needed some quick relief. 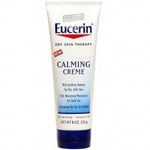 For me, the battle with eczema has been a daily one, and when I apply this cream to my skin, I do it to make me feel better but all it ends up doing is making my itchy red skin feel a little moister. I still itch, I still bleed from scratching. I’m not sure why this product doesn’t work so well for me, but it just doesn’t work at all. Now every time I get a little bit of dry skin, I rub this on and it helps me with no problems. But When I get a serious rash or really need to medicate myself, this ends up just obstructing me and preventing me from applying really helpful lotions. This lotion is not so great.